The BVX16CFK provides 8-steps of counterbalance (steps 1-8) and the BVX25CFK has 16 individual steps of counterbalance allowing you to dial in the right amount of counterbalance required for each setup. Each step is repeatable which helps save time when changing lenses or adding accessories. The pan drag and tilt drag mechanisms each provide 6 individual steps (1-6) of drag adjustment to help fine tune the smooth movements. A sliding top plate with a snap-in style quick release can be shifted forward or backward to help properly balance your camera rig. The carbon fiber tripod is a 2 stage, 3 section tandem style which incorporates a 100mm bowl. The leg locks are oversized levers that can be operated while wearing gloves. The lower stage leg lock lever has an additional lip, which can be opened and closed with your foot. This allows you to hold onto your camera rig while adjusting the height of the tripod. Each tripod includes a floor spreader, a telescoping pan arm and a padded carrying case. 8-step counterbalance - Dial in the right amount of counterbalance required for each setup. Each step is repeatable which helps save time when changing lenses or adding accessories. Supports Heavy Payloads - The BVX16H video head supports up to 35 lb (16 kg) and the 100mm bowl tripod has a maximum load capacity of 132 lb (60 kg). Sliding Top Plate - The sliding top plate with a snap-in style quick release can be shifted forward or backward to help properly balance your camera rig. Carbon Fiber Legs - The carbon fiber tripod is a 2 stage, 3 section tandem style which incorporates a 100mm bowl. Carry Case & Floor Spreader Included – A floor spreader, a telescoping pan arm and a padded carrying case are included in the box. 16-step counterbalance - Dial in the right amount of counterbalance required for each setup. Each step is repeatable which helps save time when changing lenses or adding accessories. Supports Heavy Payloads - The BVX25H video head supports up to 55 lb (25 kg) and the 100mm bowl tripod has a maximum load capacity of 132 lb (60 kg). 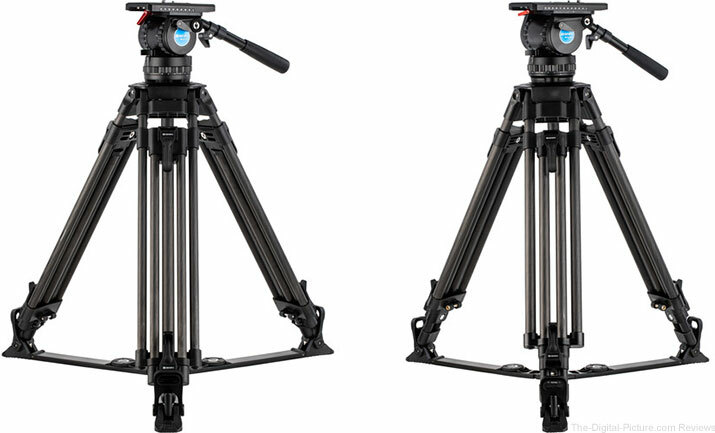 B&H carries the Benro BVX tripods.